For a description of the exercise, see below. But first, what I wrote…. It was sunny but cool that Sunday afternoon when we drove out to the park. Francine wore a wool coat to match her church skirt; I kept my suit jacket buttoned. The ground was still soft with spring, the brown river swift in the center current though the reeds by the bank hardly stirred. There was a breeze in the air that caught Franny’s curls like the sails of a toy boat, and she kept turning her head into and out of the breeze to keep her hair as neat as she could. We laughed as we walked along the grassy river bank, talking about what she might cook for supper–I said I wanted steak and she told me not to hold my breath, that if steak was what I wanted I’d need to get a raise first, and she was planning on a roast chicken with butter beans and mashed potatoes. Which sounded just fine to me. We’ve been coming to this park almost since the day we met at the church picnic a couple of years ago. She was just out of high school and though I was a several years beyond her we weren’t out of each other’s reach. We chatted a bit at the picnic but didn’t think much of the event—she seemed shy and I remembered without her saying so that her mother had died a few years back in an auto accident and her father was still sick with grief. She’d been coming alone to church for a year or so by then. I didn’t bring it up because I didn’t want to upset her, and when we’d run out of pleasantries about the weather or the sermon, I thought it best to drift away. The Lion’s Club was hosting ice cream out at the park that same afternoon, and I drove over for a bite, thinking if I managed to eat a full desert after the church’s picnic I might be able to skip supper and save on my groceries. The crowd was small that afternoon and the organizer, my friend Bruce who ran a dairy farm out in the hills, allowed me a second bowl. But I’d not yet dipped into it when I recognized her, standing along over by a low rock wall, leaning against it as though she was posing for a photograph. I offered her my seconds and we spent the whole afternoon right there on that wall, just sitting and shooting the breeze. All these afternoons running together. The same park, the same wall, the same tree, the same river. It’s why we started going out to that park every Sunday that the weather allowed, even in the gray winter, the both of us huddled in heavy coats. Some people might think a habit like that would get awfully repetitive, and they’d be right, but that was the point: For us the park held not a series of similar moments but the same moment, revisited again and again, and in that moment we were eternally fresh, forever falling in love. That’s what we’d tell folks. And I think it was the truth. That day, when I took along my second-hand ArgoFlex to try a few snaps, something was different. Maybe it was the camera, the fact that I was documenting a single moment, freezing it alone of all the Sunday afternoons we’d shared out there. Pulling it loose from the one eternal moment, like pulling a card from a house of cards. It could be that because I photographed it I remember it better than all the other days, the way you remember a detail better when you write it down. For a long while we just sat on the rock wall, same as we always did when the weather was warm enough, neither of us saying much. We liked these moments, the sound of the breeze through the trees, the whisper of the river. I watched the play of light through the treetops and set up a snap of the little wood shed where the caretakers keep their rakes. The way the sun hit it, with the fat cedar bush grown up against one corner of the building, the shadow of the shed looked like a mitten. As I fiddled with the lenses I glanced at Franny to point out the mitten, and she wasn’t looking at me or at anything, her eyes cast down toward the post at the end of the rock wall. She was running her hands over her new stockings, her palms smoothing down the nylon in long strokes. I thought she might be sad and I ducked my head to catch her eye but she smiled when she saw me. 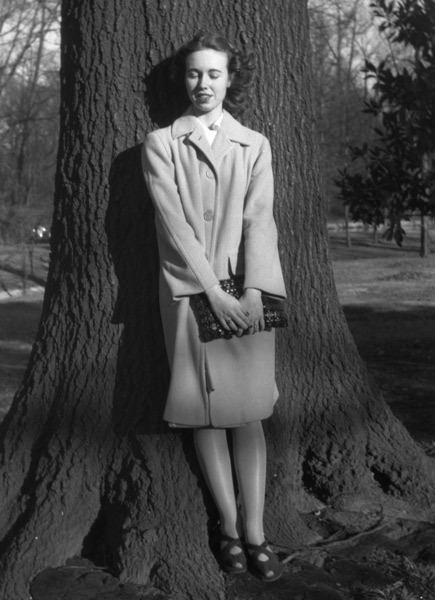 Later, I posed her against a big pecan tree, the trunk twice as wide as she was and fluted with a deep curve so it seemed to hug her. She leaned into it that way, the way she’d lean into me sometimes at home, in the kitchen, and while I fiddled with the lenses I directed her pose. Purse in front, hands over it. Don’t cross your legs. Square your shoulders. Tilt your head. The boxy ArgoFlex wasn’t anything special but I felt like a professional. I told her to smile, and she did, her eyes bright in the sun. A light gust blew through and flipped out the fold in her coat, parted it a little so her skirt showed through. I snapped the photo to catch the shape of her clothes and her hair in the breeze but in that same moment she looked down, same expression she’d had the wall, her smile no longer posed but thoughtful. “What’s going on in that head of yours today,” I said. I was laughing, because the picture wasn’t what I’d set up but I thought it might turn out anyway and I was just experimenting anyway. “Just thinking,” she said, and I had no idea then what she was thinking, just as she had no idea then how I’d react when she did let on, or how different it turned out we were after all. I chose this particular photo simply because the girl’s face was so interesting. Since this photo comes from an era where photos weren’t cheap and every shot had to count, it seems odd that she’s not looking directly at the camera. 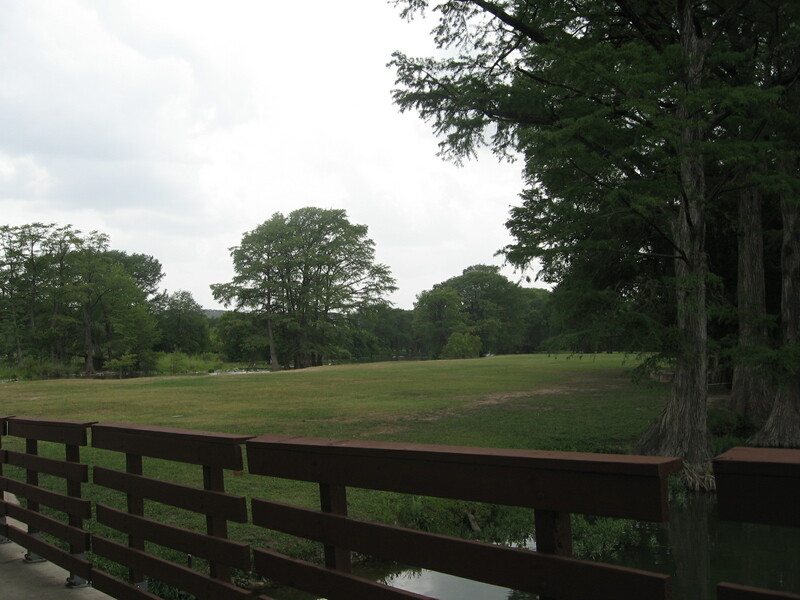 But the main reason I chose it was because it reminded me of trips I’ve taken with my wife, especially our afternoon jaunt last summer in Schreiner Park in Kerrville, TX. 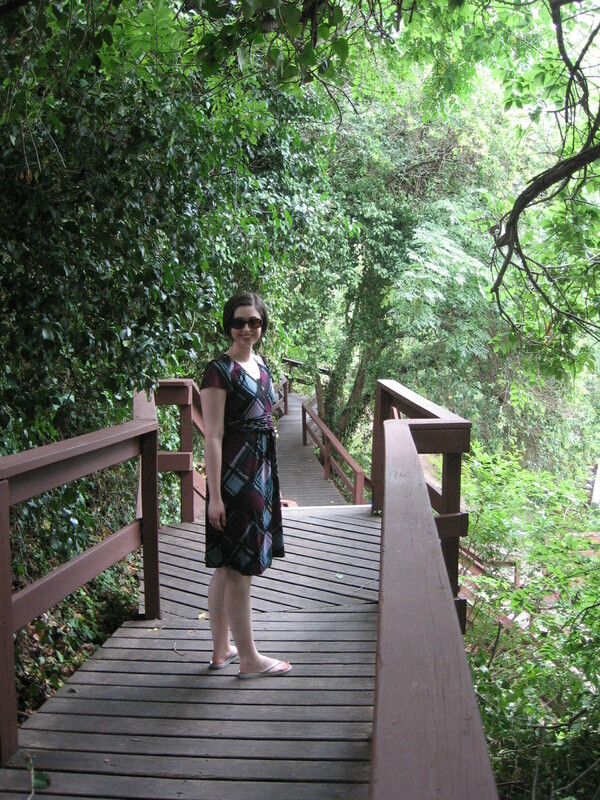 My wife, Jennifer Snoek-Brown, at Schreiner Park, summer 2009. I love this photo. And I love your wife’s dress in her photo. And I love the website about the found photos. And I love your story. Gee, don’t I love a lot today, Sam? I’m having a big heart day. Thanks! I love that site, too, particularly this set of photos. There were some others that might have been more visually dynamic or made for better stories (that photo at the end of the set, where she’s sitting on a bench with her legs crossed and smiling at the camera, is fantastic), but there was something so intimate about this photo, her closed eyes and that light, private smile, the accidental spontaneity in such a posed shot. I have a hard time looking away from this photo, and I suspect the narrator does, too. Coolest part? This turns out to have become more than “just an exercise.” I kept thinking about these two characters, Francine and the narrator, about their situation and what’s going on in Francine’s head, and I realized, these two are actually the grandparents of the main character in another story I’ve long wrestled with. I doubt either Francine or Carl will make a direct appearance in that story, but the character’s grandmother (now Francine) was a major part of the backstory, and now I know a lot more about that backstory! So, writing exercises win again!